Dwight Powell's bread and butter remains as a potential face-up power forward, where he combines his incredible athleticism with potential as a jump shooter, although he connected on perimeter attempts at an inconsistent a rate that yield 0.74 points per possession. His athleticism helped him draw fouls on 20.5% of his possessions, a solid number which helped him maintain a solid level of efficiency. In order to fully utilize his athleticism, his jump shot will have to become more consistent. 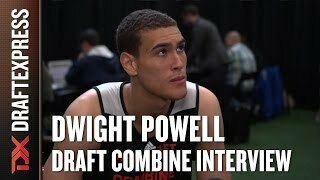 Dwight Powell: The Stanford big man measured an impressive 6-11 with shoes, the second-best in the combine. That should be taken in context, as only three players measured at 6-10 or taller without shoes (last year there were 10). While Powell isn't the most intriguing prospect, his size will allow him to play both power forward and center if need be. After a breakout junior season, talented senior forward Dwight Powell hoped to take the next step in his progression as a prospect. While Stanford as a team had one of their better seasons under coach Johnny Dawkins, culminating in a surprising win over second seeded Kansas in the NCAA Tournament Round of 32, Powell's individual production did not take the jump some may have expected. Powell's averages of 17.1 points per 40 minutes pace adjusted (down from 18.9), and 8.5 rebounds per 40 pace adjusted (down from 11.0) were significantly lower from his breakout junior campaign. Part of that was situational, as the veteran-laden Cardinals saw increased contributions from Chasson Randle, Anthony Brown and Stefan Nastic, taking possessions away from Powell, who was used much more as a high-post distributor in their Triangle offense than in the past. Still, Powell's lack of progress has to be viewed as a disappointment considering his talent-level. That being said, Powell's proficiency both in the post and on the perimeter continues to present a matchup problem for many at the collegiate level. Powell's bread and butter in the post continues to be his right handed hook shot, which has shown continued improvement. With soft touch, a high release point, and a quick spin move he occasionally uses to set it up, the shot has become Powell's go-to move in the post. The rest of his post game continues to be a work in progress. Powell's strength in his lower body and in his core, while improved over where it was when he came to Stanford, still remains underdeveloped, and he struggles to establish and maintain deep post position, and can easily get dislodged, because of it. He also has a very unrefined left hand and few reliable moves over his right shoulder, making him fairly predictable in the post. Stepping away from the hoop is where Powell may find the most success at the next level. His jump shot remains inconsistent, and at 0.743 points per possession according to Synergy Sports Technology, fairly ineffective. He struggled to build on the promise he showed from three point range last year, when he shot 45.5% from deep, albeit on such a low sample size (1.0 attempts per game) that he really need a strong showing this year to reinforce that what we were seeing would hold true. He struggled to do so, connecting on only 26% of his attempts this season. Despite the relative lack of efficiency, Powell's jump shot looks mechanically sound, with a high release and a good follow through that could lead to more dependability in the future with more time and repetition. One area that has shown a bit of improvement is that Powell has shown an increasing ability to hit jumpers not only from a standstill, but on the move as well, using one or two dribbles in either direction to setup a pull-up jump shot. A continued improvement in the reliability of his jump shot would open up what is perhaps the most intriguing part of Powell's game, which is his potential as a face-up power forward. Powell is a mobile athlete, showing a good combination of ball handling ability, quickness, and fluidity for a player his size, although he's often too passive to take advantage of that. Powell does have a very high basketball IQ, posting one of the best assist rates of any of the big men in this draft. He does a great job of seeing cutters diving to the rim and is excellent in dribble hand-off situations, giving him added versatility facing the basket at both the 4 and 5 positions. While Powell doesn't execute all that much in the way of advanced ball handling moves, he does have a nice left to right spin, and is capable of taking his man off the dribble in either direction. Once he gets into the lane, he has good elevation, excellent body control, and a soft touch around the basket, although he tends to have more of a finesse game inside. While he's comfortable handling the ball with either hand, in traffic he tends to shy away from finishing with his left hand, making him fairly predictable down low and making it easier for defenders to challenge his shot. Powell's perimeter-oriented game and a general lack of rebounding instincts hurt him on the glass, where he's rather pedestrian on both ends of the court, coming in at only 8.4 rebounds per 40 minutes, pace adjusted. Powell has never been a great offensive rebounder, with most of his drop off coming on the defensive side of the ball. Stanford plays a fairly big front court, with Powell sharing time with Stefan Nastic and Josh Huestis, and Stanford was a fairly good defensive rebounding team as a whole. Still, Powell's lack of lower body strength comes into play here, as he frequently struggles to maintain position in a box out, and he doesn't have the greatest instincts or mindset to be a dominant rebounder, as he clearly lacks toughness. One area where Powell has made some strides is as a defender. There are still ample questions about how this will translate to the next level, as he lacks the lower body strength to defend in the post, while also not providing much help as a weak side shot blocker. He has shown some improvement on the perimeter, however, doing a better job of getting into a defensive stance, moving his feet, and using his length to contest shots. He still remains extremely foul prone, at 3.8 personal fouls per 40 minutes pace adjusted, although this is a strong improvement over the 5.0 per 40 minutes pace adjusted he averaged over the first two years of his collegiate career. Dwight Powell may not have made the statistical improvement many hoped for, and he still has some of the same holes in his game that have made him a frustrating, albeit tantalizing, prospect over the years. Still his combination of fluidity, ball handling, and potential face-up game bring a fair amount of intrigue in a league that is becoming increasingly perimeter and space oriented. While Powell will be 23 years old by the time his rookie season is set to begin, if some team believes that they can take the promise he shows as a jump shooter and make that into a consistent, reliable weapon, there may be some untapped potential there. While Dwight Powell entered Stanford as a consensus top-50 high school recruit, it took him until his junior season until he started to play like one. After struggling with prolonged bouts of inconsistency during his freshman and sophomore seasons, he has seemingly turned a corner. Now, averaging 15.8 points and 8.3 rebounds per game, Powell has battled through adversity to emerge as a top option for the Stanford Cardinal, a team that badly needs both his production and leadership. Standing 6'10 with a wiry 235-pound frame and a 7'0 wingspan, Powell has excellent size for the power forward position. While he must continue to get stronger, Powell has done a good job of adding muscle to his frame without detracting from his intriguing athletic profile. While not the most explosive athlete, Powell is incredibly smooth, quick for his size, and very mobile overall. Ultimately, while Powell is likely another 20-pounds away his optimal playing size, he has the physical tools to excel as a power forward in the NBA. His skill set certainly helps his cause as well, as perhaps the most impressive aspect of his increased productivity  he averages 19.4 points per 40 minutes pace adjusted, up from 12.7 as a junior  is his diverse skill set. Though nearly 65% of his scoring comes around the basket another 30% comes from jump shots from all over the floor. Furthermore, according to Synergy, Powell finds 22.4% of his offense in post-ups, 17.2% in isolation sets, 15% off of spot-up jump shots, and 10.8 off of cuts. Entering his junior season, Powell had built up a reputation for playing soft in the post. On film, it is clear that he lacks the ideal strength, particularly in his core and lower body, to both hold his position on the block and to finish through contact. Many of his 3.1 turnovers per 40 minutes pace-adjusted come from simply losing control of the ball in the post. Furthermore, he is not a particularly efficient scorer inside, converting just 42.6% of his attempts out of post-ups and shooting a career low 47.5% from inside of the arc, which ranks him in the bottom of half of our top-100 prospects. He has, however, developed a solid right-handed jump hook and functional footwork pivoting on the block. The question remains whether he'll be able to score inside at the next level, especially given his struggles against PAC-12 competition. He is at his best, however, away from the basket, operating in either spot-up or face-up capacities from the mid-range to the perimeter. By the numbers, Powell is not a particularly efficient jump shooter, making 32.1% of his 81 attempts, which are divided evenly between shots around the basket, from mid-range, and from beyond the arc. He is, by far, most effective shooting the ball from deep, where he makes 46.2% of his 1.4 attempts per 40 minutes pace adjusted while showing solid mechanics, complete with a quick release and a high release point. In addition to being a competent spot-up shooter, he has also shown the ability to occasionally get his shot off of the dribble from mid-range. Powell's biggest strength is also his weakness, however, as his tendency to fall in love with his jump shot often results in him floating around the perimeter rather than banging in the post or attacking off the bounce. Unlike many spot-up shooting big men, the junior consistently flashes the ability to take his man off of the dribble, usually with a simple fake-and-go or rip through move. Able to put the ball on the floor and attack with either hand while showing excellent body control when finishing in the paint, Powell's quickness and functional ball-handling put a lot of pressure on opposing defenses. On the defensive end, Powell's physical profile is intriguing even if the results are mixed. Though he displays good lateral quickness for his size, he does not seem to be the most focused or physical defender, which tends to limit his effectiveness staying in front of his man on the perimeter. Combined with his lack of bulk, his average awareness negatively affects his ability to guard bigger players in the post. On the plus side, he looks far more patient and less foul prone as a junior, even if he still commits 4.0 fouls per 40 minutes pace adjusted. Additionally, his physical gifts allow him to contribute statistically in a variety of ways, to the tune of 1.0 steals and 1.4 blocks per 40 minutes pace adjusted. On the whole, if Powell is going to reach his potential on the defensive end of the floor, he'll need to improve his intensity and toughness. He has all the tools to hold his own on this end of the floor, but he does not consistently make the most of his size and athleticism when defending one-on-one or crashing the glass. In sum, while Powell has shown a significant amount of improvement thus far in his junior season, he still has a long way to go before realizing his potential. Compounding these question marks is the fact that he is a year older than the rest of his class. To this end, scouts wonder how much he can still improve from both a physical and a skill-level standpoint. Ultimately, however, Powell presents an intriguing combination of a legitimate face-up game with NBA caliber size and athleticism, which will keep scouts interested even if he does not significantly improve much further. A potential early-entry candidate for the 2013 draft, Powell is a player to keep an eye on moving forward. Arguably the most important recruit in head coach Johnny Dawkins' tenure at Stanford thus far, Dwight Powell came into college with huge expectations of turning around a program that has stagnated somewhat in recent years. A little old for a sophomore (he turned 20 in July), Powell started playing basketball later than most, picking up the sport in Canada when he was 14 years old. A mobile big man with a nice frame that is still a ways away from filling out, Powell shows good quickness and fluidity for his position to go along with solid size and length. Besides his athleticism, Powell shows an intriguing skill-level as well as a good feel for the game. He was not the focal point of Stanford's offense, but was able to show flashes of talent in a variety of different areas and has a nice upside to grow into as his frame fills out. Where Powell looks most comfortable right now is on the perimeter. He can put the ball on the floor nicely, utilizing shot fakes and beating his man off dribble impressively with a good first step and notable ball-handling skills, even if he can't always finish what he creates around the basket due to his lack of strength. He got to the free throw line at a decent rate last season, and converted a solid 68% of his attempts once there. About 1/3rd of Powell's field goal attempts came on jumpers, but he was very inconsistent in this area, converting on just 26% of those shots, including 7-25 from beyond the 3-point line. Powell shows very nice shooting mechanics and should be able to develop into a capable floor-spacer in time, but he certainly wasn't a dangerous threat last year. This upcoming season should give us a better sense of Powell's potential in this area, something that will play a big part of his pro evaluation eventually. Inside the post, Powell doesn't have much of a post game to speak of at the moment, as he just does not possess the lower body strength needed to establish deep enough position to get high percentage shots off. His hands, footwork and touch all show great potential, but he'll need to become a little tougher and scrappier to take advantage of his size closer to the rim. At the moment, he much prefers to sag out onto the perimeter. Defensively is where Powell might be the furthest from being able to see serious playing time in the NBA right now. He struggled badly trying to keep opponents out of the paint as a freshman, getting backed down and pushed around at will, and not showing great toughness fighting back. Foul trouble hampered him in many of Stanford's contests, as he committed four or more fouls in 13 of their 31 games last season. He was similarly ineffective out on the perimeter, as his fundamentals and awareness are just average, which is something he'll have to work on down the road. He's very mobile for a player his size, but lacks significant experience. Powell didn't contribute much as either a rebounder or shot-blocker eithersomething he should be able to do more of in the future considering his physical tools. All in all, Powell's freshman year was definitely a learning process, as the transition from high school to college was not a seamless process, even if he did show some intriguing flashes from time to time. Nevertheless, he shows very good potential to continue to improve down the road, as he possesses a rare combination of size, fluidity, skills and feel for the gamealbeit in a pretty raw package at the moment. How his body fills out as he continues to mature physically will likely dictate the type of strides he's able to make over the next year or two. It may take some time as we've seen in the past from players in his mold, but the end result could be very much worth waiting for.